No ice cream maker at home? Not a problem. It’s simple to make a no churn ice cream. Just take a look at this easy vanilla keto ice cream recipe without condensed milk. What’s wrong with churning you ask? Nothing. After all, grass-fed butter, a staple of most keto diets, is made via churning, as is all butter. But in order to enjoy ice cream that tastes just like you remember before you went Keto, you’d need an ice cream maker at home. Most people don’t have ice cream makers at home for a few reasons. Firstly, the cost. Top-end home units run several hundred dollars. Secondly, not everyone has the space. Thirdly, is the convenience factor. It’s just easier for most people to go to an ice cream shop. 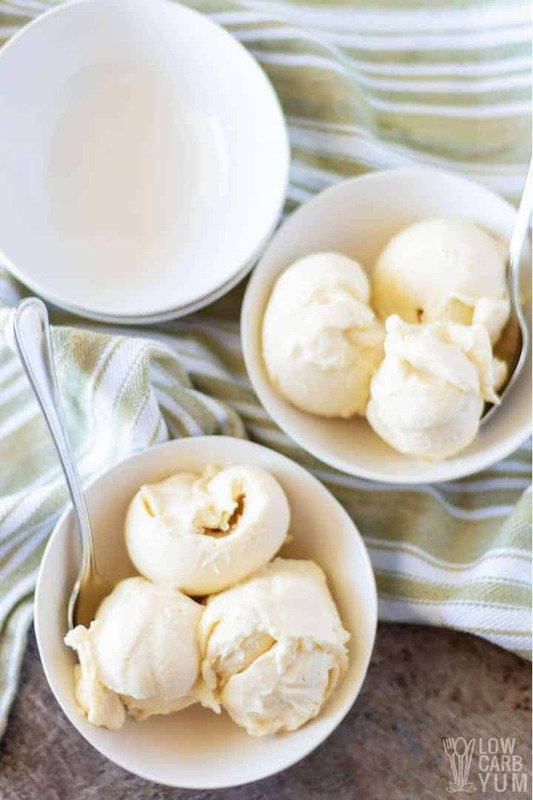 But you can make an easy vanilla keto ice cream recipe at home. 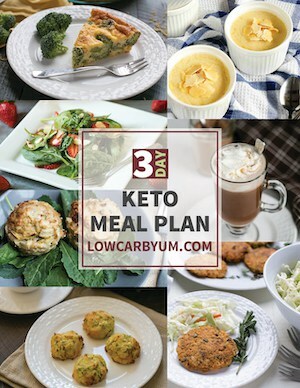 But if you’re on a Ketogenic diet, the fourth reason is obviously that regular no churn ice cream is not keto-friendly. 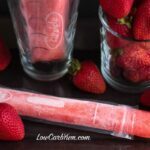 So how do you make this simple keto-friendly frozen treat? The other problem with making your own keto ice cream is that most no churn recipes call for condensed milk. 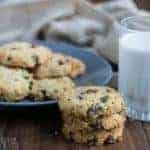 Other than grass-fed butter and perhaps some raw cream, most people living the Keto lifestyle won’t have any conventional milk products. The solution to making quick, homemade vanilla no churn ice cream without condensed milk is to whip an egg. The egg combines with the heavy whipping cream to simulate the texture of conventional dairy ice cream. 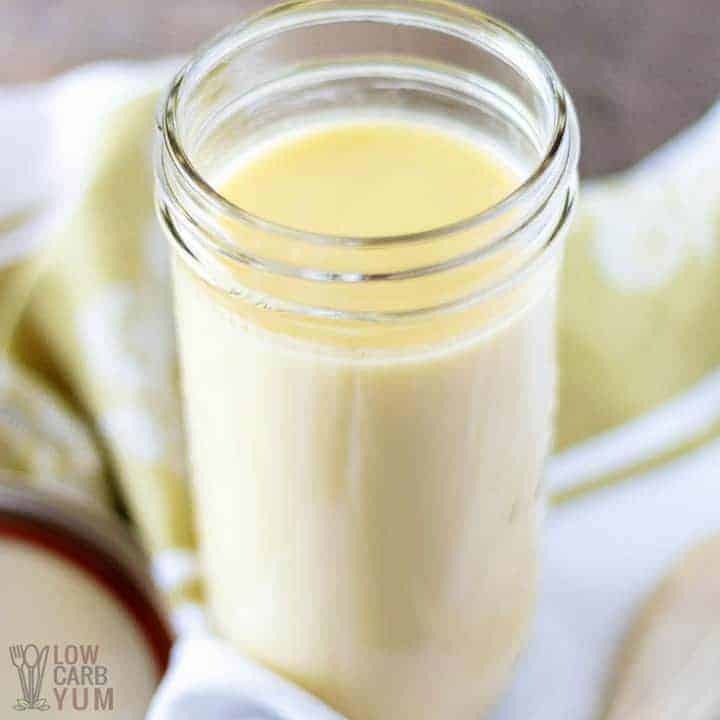 If you’re new to the Keto lifestyle and wondering why condensed milk is a keto no-no, here’s why…. 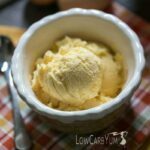 Even though this no churn ice cream recipe calls for heavy whipping cream, which is dairy, the cream is virtually all fat and no carbs. In comparison, the typical serving of condensed milk contains over 20 net grams of carbs. 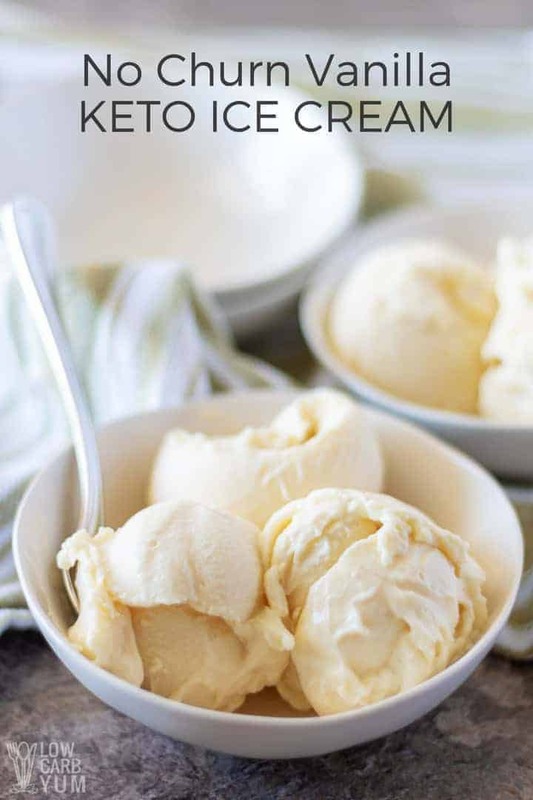 You’ll see I also include gelatin in this vanilla no churn ice cream recipe without condensed milk. 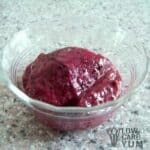 But don’t confuse gelatin in this keto ice cream recipe with Jello-O gelatin from your childhood. Yes, Jell-O contains some gelatin. Gelatin has become somewhat of a nutrition fad again. But thankfully, for healthier reasons than its being an ingredient in Jello-O. Gelatin is derived from collagen. Collagen is animal protein that comes from the parts of cow, chicken, fish or pig that we don’t normally eat. Although that may sound unappetizing, here’s why it’s good for you. It’s by consuming the collagen protein of other animals that we strengthen our own collagen. Collagen is the most abundant protein in the body. About 30% of all the proteins that make you, well, you, are collagen. Think of it as the glue that holds your skin, hair, nails, bones, muscles and the rest of your bodily tissue together. In fact, about 70% of your body’s tissue is collagen protein. The problem is that after about age 30, your body’s collagen starts breaking down. And that’s why bone broth, gelatin and collagen protein have become so popular. So why not add this amazing supplement to a vanilla no churn ice cream without condensed milk? Now let’s get back to your childhood for a second. The reason why Jell-O isn’t healthy is three-fold…..
Firstly, the sugar content. A 3 oz. serving of Strawberry Jell-O contains, wait for it … a whopping 71 grams of sugar. Secondly, there’s no dietary fat to slow down the massive insulin spike. And third, Jell0-O contains the artificial food dye, Red #40, which can cause several health problems. But gelatin just by itself, which is collagen protein that’s been cooked, is healthy for you. 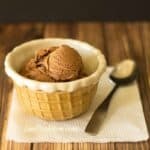 And, it provides a thick texture to this vanilla keto ice cream recipe. Even the fanciest home ice cream maker requires a long churn cycle. But the advantage of making your own no churn ice cream is that you don’t have to wait for a machine to do it’s thing. On the contrary, if you follow this no churn ice cream recipe, it will be ready to eat within a handful of hours. Just get some heavy whipping cream and an egg instead of using condensed milk. Most foodies prefer the taste of organic vanilla extract from Madagascar instead of the lower quality variety that’s sold by large commercial spice retailers such as McCormick. Another advantage of homemade ice cream is you get to control the ingredients, especially how sweet it is. If you’re like me, the taste of most conventional ice cream tastes artificial. 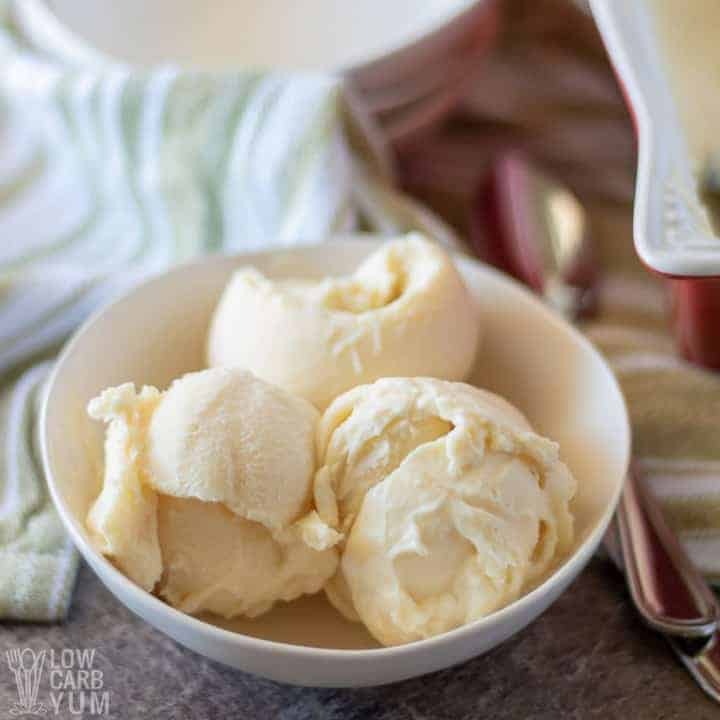 But with this vanilla no churn ice cream recipe without condensed milk, I just use about 3/4 cup of a natural sugar alternative such as Stevia. Just be careful to control the add-ins. 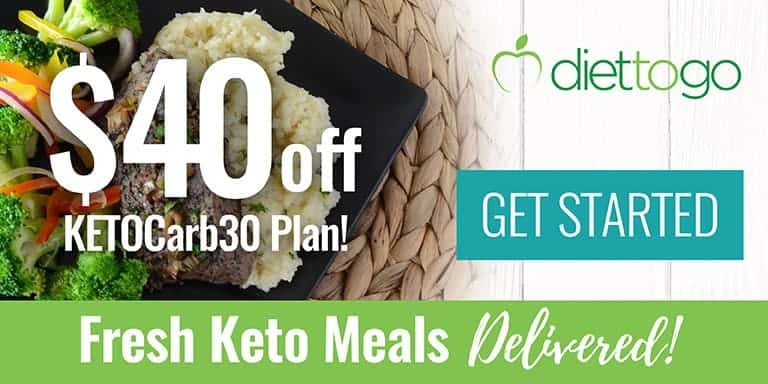 And if you’re going to add anything extra, remember to factor in net carbs if you’re sticking with Keto. A few organic chocolate chips are ok, but just watch out you don’t push yourself out of ketosis. Actually, try my recipe first. 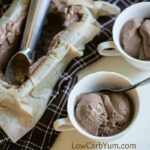 I’m confident you won’t feel the need to add anything to this no low carb ice cream recipe. But, feel free to top it with some sugar free chocolate syrup if you’d like. 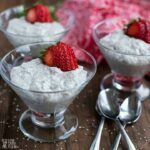 And this frozen low carb treat can also be used to make a copycat Shamrock Shake or Coffee Milkshake. Enjoy! 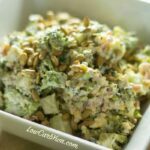 Hope you enjoy this cool and refreshing low carb treat! No ice cream maker at home? Not a problem. It's simple to make a homemade ice cream. 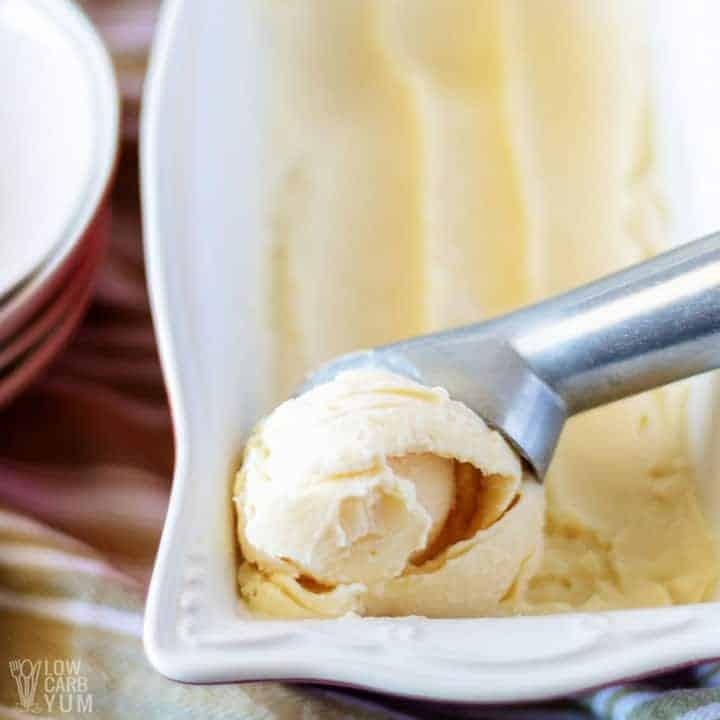 Just take a look at this easy no churn ice cream without condensed milk. Combine the heavy cream, egg, vanilla extract, gelatin, sweetener, and sea salt in medium saucepan over medium heat. Let the mixture cook until it begins to steep (strands of steam form on top of the heated liquid). 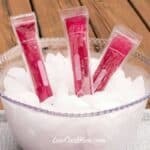 Transfer the liquid to a heat-safe container and place it into your fridge for 60 to 70 minutes so the liquid can cool. After the base has cooled, pour it into a stand mixer or large bowl and use a hand mixer to beat the ice cream base until begins whip into soft peaks. Place the whipped ice cream into a freezer safe container, cover it, and let it freeze for at least 4 hours before serving. Strain the liquid before whipping it. A mason jar makes a great container to chill the base in fridge. 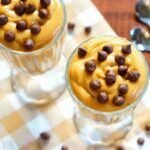 You can leave out the gelatin if you don’t like the texture of frozen pudding. Try using liquid sweetener to lower the carbs.